You have probably already seen henna tattoos on Middle Eastern brides- elaborately done designs which leave you wishing you had some of your own. What you may not know is that this decorative art traces its origins to the ancient times, and continues to live through current day rituals that have been passed down many generations. Henna is a small shrub that grows in Middle Eastern countries like Pakistan, Iran, India, Yemen and even North Africa. Scientifically, henna is known as lawsonia inermis. In order for henna to be applied to the skin, the young leaves of the plant are dried up then ground into a fine powder. This powder is then mixed with water to produce a paste which is then applied on the desired part of the body. Besides being used to draw beautiful designs on the skin, henna is also used to dye hair and may also be applied on nails. 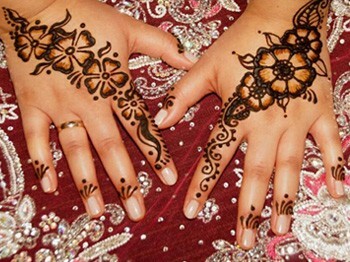 In countries where henna application is popular, henna designs are a central part of ceremonies such as weddings, where brides are decorated in detailed and elaborate henna tattoos. How is the henna applied onto the skin? Different people use different methods to get the henna on the skin according to the desired shapes and designs. However, the common methods involve putting the paste into a syringe or cone and using these to draw the designs on the skin. Whichever method is used, our aim at threading and more is to ensure the henna is applied accurately on the skin. Any errors will result in distorted designs which cannot just be easily erased. How long before the henna stains? Usually, after we have applied the paste on your skin, it takes thirty minutes to one hour to dry. However, the henna must stay on the skin for a few hours before the henna stains properly. The longer the henna is left on, the darker it stains. If we are doing henna tattoos on your feet and hands, 4 to 6 hours should be enough to allow proper staining, while 6 to 8 hours is the recommended period for proper staining of the back of hands and wrist area. How long does the henna tattoo last? Usually, henna tattoos will last about two to three weeks, but this depends on how darkly the henna stained the skin in the first place, and also the area of the body the tattoo is on. Henna tattoos are a great way to experience the beauty of tattoos without the pain that is associated with tattooing. Also, since henna tattoos are not permanent you can get different designs as often as you wish, and over time you might learn to do the henna tattoos on your own. It is a great experience to share with your friends too, and a good way to experience another culture. If you are hoping to get some henna tattoos done, contact us at threading and more beauty salon. Besides keeping your eyebrows in perfect shape, we will give you another reason to look forward to your appointments.